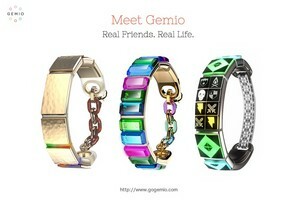 SEATTLE, WA--(Marketwired - Oct 6, 2015) - Gemio today announced the formal launch of its social wearable for teens: a smart friendship bracelet that connects real friends in real life. Gemio is the first wearable designed for teens that is focused on self-expression and connecting with friends. Gemio is angel-funded by Facebook's first VP of Sales and other notable tech and media executives. With Gemio, teens connect their bracelets in-person, creating a network of real life friends. Teens personalize their bracelets in two ways (i) changing detachable gems, and (ii) creating light effects from a pallette of millions of colors. Light effects can be designed to communicate between friends to tell you when they are nearby or trying to reach you. You can send messages to friends in the form of light effects that appear on their bracelets. "What matters to teens is self-expression. They are creative and innovative and want to design their own look. Today's teens don't buy brands, they are the brand," said Michael Bettua, Gemio CEO and Co-founder. "Gemio is the future of connected jewelry for teens, combining beautiful light effects and personalized design. It's like no wearable you've seen before. Gemio sparkles with the twist of a wrist, or point it at an outfit and it changes colors to match." The team of leading technologists and entrepreneurs behind Gemio includes CEO and Co-founder, Michael Bettua, who founded and built Max Mirani, and also served in senior roles at two billion dollar IPO startups. Gemio Vice President of Global Marketing & Merchandising, Christy Saito previously served as a product and merchandising executive for Nike and Crocs and brings extensive expertise in teen products. Gemio Co-founder and CTO, Tim Chinowsky is a rocket scientist from MIT with experience in designing electronic and electromechanical devices for scientific, medical, and consumer applications. Co-Founder, Martin Unger heads up Gemio's software and user experience, bringing extensive design and development experience from such companies as Urbanspoon and Jobster. Gemio's board of directors and investors include some of the most well-known players in technology and media, including early Facebook employee and first VP of Sales, Tricia Black; The Onion Founder, Tim Keck; activist, author and journalist Dan Savage; Silknet Software Founder and CEO, James Wood; BladeLogic Co-founder, Thomas Kraus; and Levelwing President and Founder, Jeff Adelson-Yan. Pre-orders for Gemio will start in late November. To get updates and find out more about Gemio, visit www.gogemio.com. Gemio creates beautiful smart jewelry to bring real friends together in real life. By combining the technological magic of the online world with the offline world, Gemio provides a powerful new form of self-expression and communication with friends, our most important social network. Gemio was founded in 2014 and is headquartered in Seattle, Washington. For more information, visit www.gogemio.com.